I will personally make you a throne that is half platnum [sic] and half solid gold and jewel encrested [sic]. 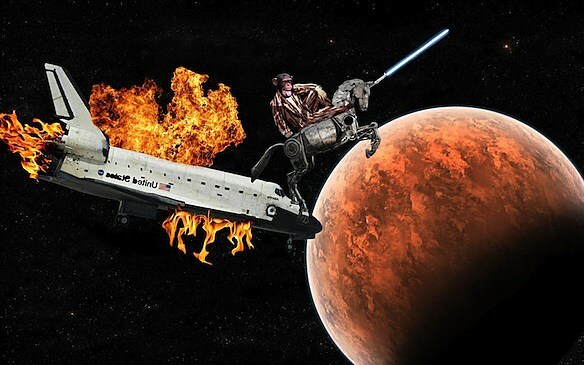 Thank you again for teaching us about meteoroligy [sic], you're more awesome than a monkey wearing a tuxedo made out [of] bacon riding a cyborg unicorn with a lightsaber for the horn on the tip of a space shuttle closing in on Mars while ingulfed [sic] in flames... And in case you didn't know, that's pretty dang sweet. P.S. Look on the back for drawing. 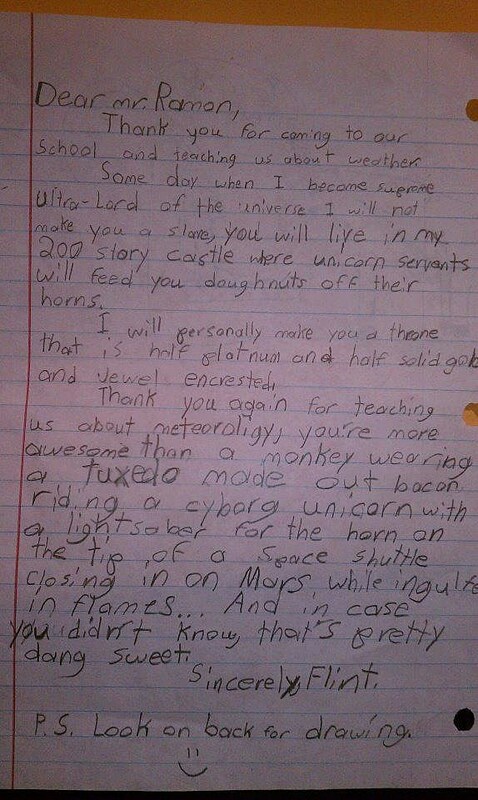 While I'd love to think that this is the entirely original work of a future Lex Luthor, given the confluence of cyborg unicorns and monkeys in bacon tuxedos (not to mention the correct spelling of "doughnuts"), I can't help but suspect that an older sibling, perhaps one who spends a lot of time on the Internet, helped young Flint compose this missive. But I can still hope that there exists a small Texan child with the creativity and drive mold the world to fit his meme-filled vision. Real or not, it's hard to deny the awesomeness young Flint has inspired.